I’ll make a bug batch of chocolate chip cookies. I will make healthy carrot cake with my Kitchen Aid! Amish bread, my daughter loves it. I think the first thing I would make using this mixer would be Christmas cookies. I would definitely make some kind of festive Christmas cake! I will make chocolate cake with raspberry cream! I’ll make cupcakes with my daughter. I’d love to try making my own pizza dough! I would make some Braided Raisin Bread. I’d make peanut butter cookies! Given the time of year, the first thing I’d make would likely be cookies. But I’ve also gotten REALLY into baking bread lately, so I would LOVE to see what this thing can do to help me in the kneading department! 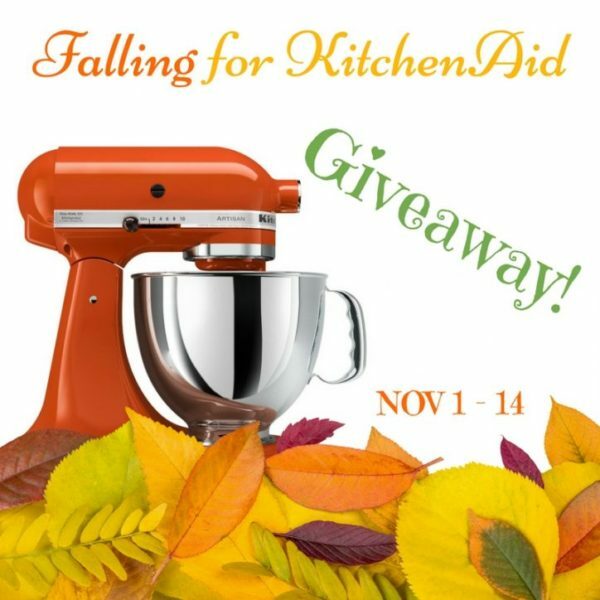 What is the first thing you will make with the KitchenAid if you are the winner? The first thing I will make with the KitchenAid is home-made bread! I would use it to make chocolate chip cookies for our family birthdays. The first thing I’d make is a cake. I’d definitely make some chocolate chip cookies. I would never get out of the kitchen.!! lol I would make lots of things. I would first make my mash potatoes. I would make a nut roll, cakes and brownies. Bread! My family loves my homemade bread and I’d love to not have to knead it by hand! I’d probably make homemade bread. It’s the best! I will make a cake with my daughter! I will make some sugar cookies! I’d like to make a chocolate cake with a new KitchenAid mixer!